I am new to azure devops. I want to clone my repository to Visual studio 2017. When I try to clone it it throws error. please suggest on this. I am able to connect to the repository however not able to clone it. In Team Explorer, underneath the Clone Repository section, notice how the top box does have spaces in the URL. Cancel the clone by clicking the Cancel link. Do this, because you'll find that you cannot edit the Clone Repository inputs. Click the Clone Repository link in the Project section of the Team Explorer window. In Team Explorer, underneath the Clone Repository section, notice how the top box does have spaces in the URL. Cancel the clone by clicking the Cancel link. Do this, because you'll find that you cannot edit the Clone Repository inputs. Click the Clone Repository link in the Project section of the Team Explorer window. You'll notice the Clone Repository section will reappear, but now will not be editable. Notice that the first/top input box has replaced any spaces in the URL with %20. Ensure that you're the second box, which maps a local path to download your source to, is accurate. Click the Clone button, and it should work. Not the answer you're looking for? Browse other questions tagged tfs visual-studio-2017 azure-devops tfs2017 azure-devops-rest-api or ask your own question. 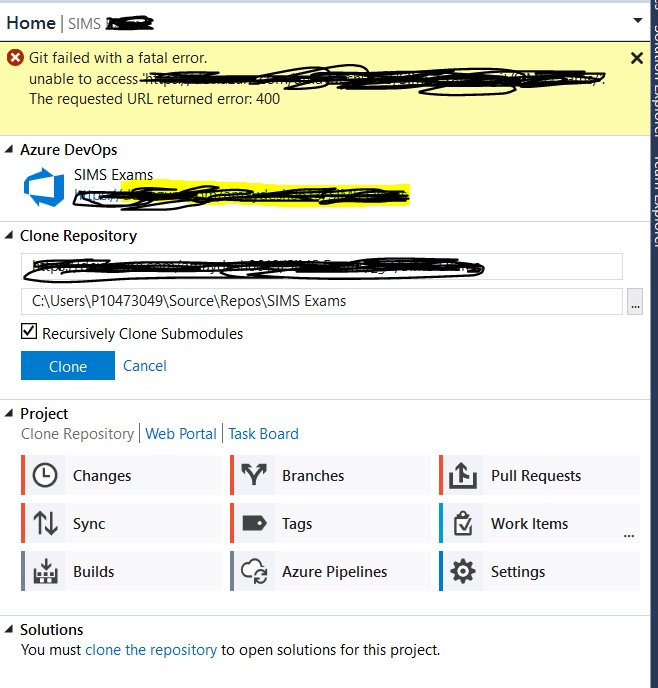 How to Import project code from local machine to Azure Repos?